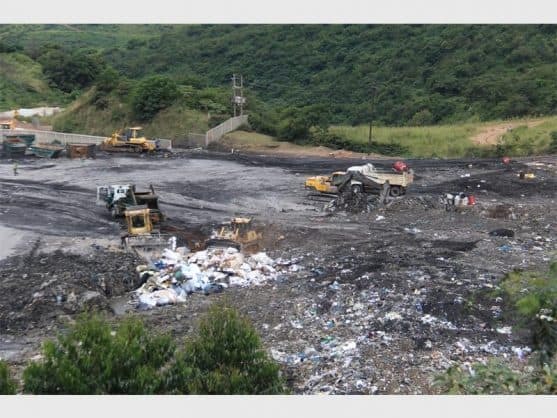 The Department of Environmental Affairs is currently investigating the malodour at Shongweni Landfill site, owned by waste management company, EnviroServ. PHOTO: Lloyd Mackenzie. Dean Thompson was cited in his personal capacity and if found guilty, faces a R10 million fine and/or jail sentence. Dean Thompson, the chief executive of waste management giant EnviroServ, will be criminally charged alongside the company on several allegations of contravening environmental legislation at EnviroServ’s Shongweni landfill site. The company has come under severe criticism over its management of the landfill by communities near and around the site. Residents have, since at least December 2015, accused the corporation of being responsible for a multitude of illnesses including nosebleeds, asthma, bronchitis and headaches as a result of “toxic fumes” emanating from the site. “Dean Thompson has been cited in his personal capacity, so there will be some personal consequences,” said Grant Walters, the Department of Environmental Affairs’ (DEA) director of enforcement for environmental impact and pollution. Walters, speaking at a press briefing in Durban on Wednesday, said if there was a guilty verdict, a maximum fine of R10 million could be issued and/or jail time. The case is set to start on April 11. Walters said the decision to prosecute was taken only after the DEA commissioned additional studies to be undertaken by EnviroServ after the company’s initial tests – which environmental activists had called “junk science” – did not give “an indication of what was happening”. “We don’t burden the taxpayer with [paying for these studies]. EnviroServ pays the specialists, but the DEA commissions them,” he said. To eliminate bias, the specialists worked according to an agreed upon scope, he said. In February, it was confirmed by the KwaZulu-Natal Directorate of Public Prosecutions (DPP) that EnviroServ would be charged with contravening the National Air Quality Act. Walters said other charges, including contravention of eThekwini Metro by-laws, were expected to be added. The landfill is also under administrative investigation. Its licence could be revoked, suspended or severally restricted depending on the outcome of the investigation. Mark Gordon, the department’s Deputy Director-General for Chemicals and Waste Management, said a decision concerning the licence or closure would be made “within the next few days”. “The reality is that if the site has its licence suspended or if it is shut down, the odour won’t go away. EnviroServ have said they will be able to re-mediate things within four to five months. To deal with the odour will not be an overnight thing, it will take a few months,” he said. He said the department was “in full agreement” with EnviroServ that a drop in pH levels had led to fostering of a sulfur-reducing bacteria, but denied that this had anything to do with changes in regulation, as the company contends. “EnviroServ should have known this would happen. The pH trend should have given them the signal,” said Gordon. He said there were enough early warning safeguards built into regulations to avoid such situations, and the onus was on the company to manage the site within legislated parameters. Gordon said other facilities had been investigated to accept the landfill’s waste should it be closed or have its licence suspended. Residents near and around the site continue to complain of the malodour and illnesses. As of 9am on Wednesday, the Upper Highway Air non-profit had registered 14 174 complaints for March.